THQ Inc. - Today launched a premium Avatar collection for Darksiders II on the Xbox 360 video game and entertainment system from Microsoft. 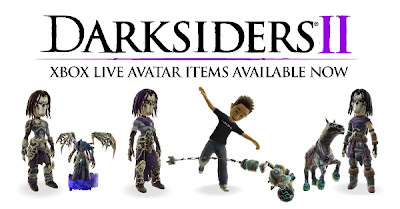 The Xbox 360 Darksiders II Avatar Collection features a broad selection of different items to customize your Avatar’s appearance ranging from full armour sets to animated props and clothing. Prices range from 80 to 400 Microsoft Points an item. A premium collection for the Playstation 3 is expected to be released at a later date. To celebrate the launch of the Darksiders II Avatar Collection THQ will be giving away a free Xbox LIVE Avatar t-shirt featuring a design by game Creative Director Joe Mad while stocks last. To find out how to claim your Avatar t-shirt visit the Darksiders II Facebook page at www.facebook.com/Darksiders. Darksiders II follows the exploits of DEATH, one of the four horsemen of the Apocalypse, in an action-packed tale that runs parallel to the events in the original Darksiders game. This epic journey propels DEATH through various light and dark realms as he tries to redeem his brother WAR, the horseman blamed for prematurely starting the Apocalypse in Darksiders. For full information on the Limited Edition and pre-order bonuses available for Darksiders II, including the shopTHQ PC exclusive which includes a free copy of Metro 2033, check out the Pre-order page at www.Darksiders.com/buy. Darksiders II is scheduled to be available for console and PC in August 2012 with a WiiU version coming at a later date, for more information check www.Darksiders.com.